Well-regarded dentist, Dr. Jacqueline Subka, welcomes adults with missing teeth interested in dental implants in Simi Valley, CA, to learn the functional, psychological and cosmetic benefits of a long-lasting implant solution. Dental implants allow patients to enjoy the advantages of having a fully functional, cosmetically appealing replacement to a missing tooth. Southern California dentist, Dr. Jacqueline Subka, is welcoming new patients from Simi Valley and encouraging existing ones with missing teeth to consider the value of receiving dental implants. The American College of Prosthodontics estimates that around 120 million people living in the United States have lost at least one tooth, which can lead to a host of cosmetic and functional issues, as well as a decrease in confidence. Dental implants are now the preferred long-lasting tooth replacement option available, offering a practically permanent solution. Each time a tooth is lost, the mouth is forced to adjust. This can lead to shifting of teeth, which creates a barrier to clear speaking and confident eating as well as a changing smile. Without the tooth root facilitating healthy bone growth, the bone tissue is reabsorbed into the body, leaving a “sunken in” spot along the gum line. Over time, this can alter the contours of the face and make a person appear older. Dental implants allow patients to enjoy the advantages of having a fully functional, cosmetically appealing replacement to a missing tooth or missing teeth. 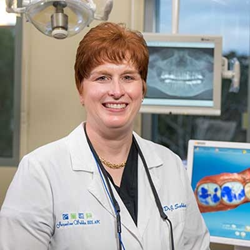 By using highly advanced CBCT imaging technology to improve precision and patient outcomes, as well as using her years of experience and advanced training, Dr. Subka can expertly place dental implants for Simi Valley, CA, patients. After healing properly, dental implants can last for 20 years or longer with proper care and regular dental visits. Those interested in setting up a no-obligation consultation with Dr. Subka to talk about getting dental implants in Simi Valley, CA, can call her practice in Thousand Oaks at 805-373-1919 with or without a referral.